Can I automatically invite listed agents to my team? There are two settings which govern how listed agents find and join your team. Both can be found in Team Settings, under Configuration. Homepass determines whether someone is a listed agent by matching their verified details to listed agents found in your listings feed. 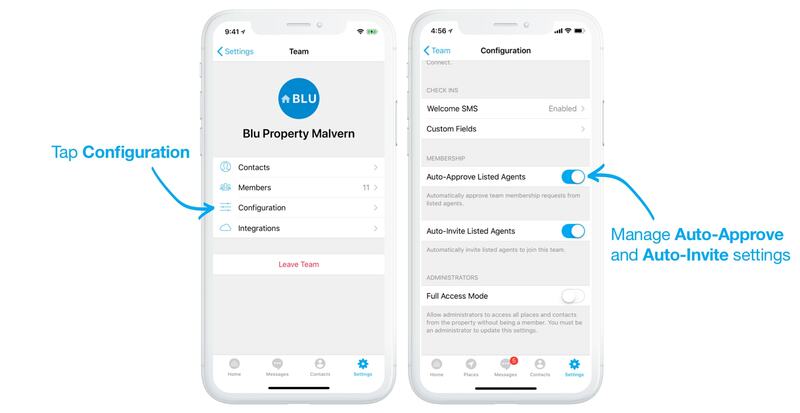 If you enable Auto-Approve Listed Agents, listed agents who request to join your team will be automatically approved. If Auto-Approve Listed Agents is enabled, you'll also be able to Auto-Invite Listed Agents. This sends an invite via SMS to any agent in your team who hasn't yet joined your team on Homepass.